AANP was proud to elevate the voices of America’s nurse practitioners (NPs) and the AANP brand at the Republican National Convention in Cleveland, Ohio, from July 18–21, 2016, and the Democratic National Convention in Philadelphia, Pennsylvania, from July 25–28, 2016. 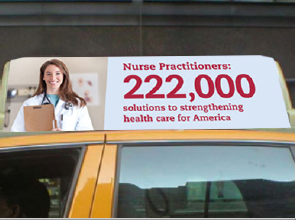 The integrated ads, “222,000 Solutions to Strengthening Health Care for America,” appeared in a variety of exciting formats, from subway cars, to taxis, outdoor ads, airport ads and cable spots. Delegates, policymakers and media professionals encountered AANP's high-visibility message and members' commitment to patient-centered, accessible, high-quality health care throughout the conventions. At the Republican Convention, delegates viewed outdoor signage that appears along the major walkway from Town City Center into Quicken Loans Arena. Interior trolley signage and subway advertising greeted delegates traveling from the airport to the downtown area as well as Quicken Loans Arena. At Cleveland Hopkins Airport, delegates were greeted in the baggage claim area with a 10-second digital ad from America’s NPs, played from 10 individual 70-inch LCD screens. AANP’s 30-second awareness spot aired in Cleveland from Monday to Thursday 6 a.m.–8 a.m. ET on Fox and Friends, CNN New Day and MSNBC Morning Joe for a total of 24 spots. At the Democratic Convention, delegates traveling by taxi and other commuters saw AANP’s ad on 50 taxis traveling the city. Delegates arriving at Philadelphia International Airport viewed 10-second digital ads in the baggage claim area on 20 individual 70-inch LCD screens. AANP’s awareness spot aired in Philadelphia from Monday to Thursday from 6 a.m.–8 a.m. ET on CNN New Day and MSNBC Morning for a total of 16 spots.